Approximately 100 people have been detained in the Russian opposition’s latest rally in Moscow in defense of the constitutional right to freedom of assembly, Kasparov.ru reports. Tuesday’s rally marked the eleventh iteration of the opposition’s Strategy 31 campaign. About 2000 people came out to Moscow’s Triumfalnaya Square to take part in the event, making it the largest rally in the campaign’s history. As with the previous ten rallies, Moscow city authorities turned down an application by Strategy 31 organizers to obtain legal sanction to hold the event. Moscow Mayor Yury Luzhkov defended this permission-based system in a session of the city government earlier in the day, saying that the city’s decision to allow or disallow any given rally is not due to any “particular love” for certain rally organizers, but to considerations for public safety. “Before every event in the capital, we take all necessary organizational measures to assure total safety for the people,” said the mayor, noting that anyone who wishes to hold a demonstration can file an application with the city and receive a decision within ten days. “We will now allow chaos in Moscow,” Luzhkov stressed. Luzhkov’s statements appear to contradict the Russian federal law that governs rallies, marches and demonstrations, which requires only a notification – not an application for permission – to be filed with the city in order to hold such an event. Tuesday’s rally was scheduled to begin at 6:00 pm, and by that time Triumfalnaya Square had already been completely cordoned off by OMON riot police and internal military forces. According to a Kasparov.ru correspondent, the police left no free space for ralliers to gather. About 50 police buses bordered the perimeter of the square, and police blocked all pedestrians from entering. Part of the sidewalk between the Tchaikovsky Concert Hall and Triumfalnaya Square, where Strategy 31 ralliers have previously gathered when the square itself was blocked off, was also cordoned off. Strategy 31 organizers issued a statement of concern on Tuesday morning regarding an interview with Russian Prime Minister Vladimir Putin that had been published the day before. In the interview, the prime minister charged that the real goal of Strategy 31 participants “is to get bludgeoned upside the head,” and that ralliers routinely provoke police into acting violently. In their response, rally organizers rejected the accusation and stated that any “possible incidents” of violence at the rally would be Putin’s personal responsibility. At the same time, Moscow City Police Chief Vladimir Kolokoltsev did promise to train his officers to detain activists using less painful methods. There was no apparent option to simply not detain any ralliers at all – Deputy Police Chief Vyacheslav Kozlov said that the unsanctioned rally would be duly broken up. A three-person delegation from the European Parliament, headed by Human Rights Committee Chairwoman Heidi Hautala, was present at the rally at the invitation of Strategy 31 organizers. Deputy Chief Kozlov said ahead of time that the delegates would not be excluded from possible detention. According to a count by Kasparov.ru correspondents, approximately 2000 ralliers gathered on Triumfalnaya Square despite the heavy police presence and the fact that the square itself is almost entirely barricaded off for construction. Nevertheless, participants managed to rally for nearly two and a half hours, chanting opposition slogans that called for Putin to step down and for the 31st article of the Russian constitution, which guarantees free assembly, to be observed. 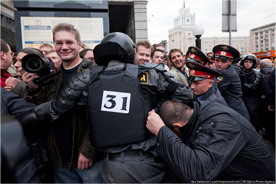 Moscow city police and Federal Security Service (FSB) agents reportedly created a jam in the crowd while attempting to push the ralliers away from the square, but did not manage to break up the protest. Kasparov.ru estimates that approximately 100 people were detained during the course of the rally, including leading opposition activists Boris Nemtsov, Ilya Yashin, Sergei Udaltsov, and Roman Dobrokhotov. Two of the three Strategy 31 organizers, Eduard Limonov and Konstantin Kosyakin, were also detained. The third organizer, Moscow Helsinki Group head and former Soviet dissident Lyudmila Alexeyeva, was present at the rally but was not detained. Official figures from the Moscow City Police cite 70 detainees, and put the number of people present at the rally at 400 people, including 300 journalists. Eyewitnesses noted that police did not refrain from acting violently while detaining rally participants. Several activists were seen with bloody faces after having been beaten by law enforcement agents. The first participant to be detained was an activist holding a poster picturing Russia’s symbolic two-headed eagle – one head being that of Russian President Dmitri Medvedev and the other of Vladimir Putin. As of 10:00 pm, several of the most high-profile detainees had been released, including Nemtsov and Limonov. Nemtsov was told that he had supposedly blocked pedestrian movement during the rally and had been detained on that basis. They and several other activists were charged with “violating the established procedure for arranging or conducting a meeting, rally, demonstration, procession, or picket,” an administrative violation punishable by a small fine. As of Tuesday night, approximately 80 detainees remained in various Moscow police stations. Strategy 31 rallies were also held on Tuesday in various cities throughout Russia, with several solidarity events also taking place in Europe. Approximately 80 out of 700 ralliers were detained in an event in St. Petersburg, and rallies were held with varying levels of success or suppression in Omsk, Yaroslav, Sochi, Voronezh, Makhachkala, and numerous other Russian cities. One event in London included the participation of refugee Russian oligarch Boris Berezovsky and the widow of murdered ex-FSB agent Alexander Litvinenko, Marina Litvinenko.